When it comes to managing resources effectively in a CRO, the most difficult thing is finding a way to balance your portfolio of work. On the face of it, that may sound deceptively straightforward – you pitch for work, work comes in (or doesn’t) you do the work and then you move on – but in reality, it’s much more complex than that. Over the years we’ve found that there are multiple factors that determine whether a company is able to manage resources effectively and we’d like to talk a bit about what we believe are the most important ones. So, how best to ensure that the project pipeline delivers the right results by striking the proper balance between bidding work and contracted work and then reviewing that balance on a regular basis? We believe there are certain key drivers involved in getting this right. Like driving safely through fog, the more visibility you have, the better you’ll be able to negotiate the twists and turns of the road ahead, and also avoid any unanticipated obstacles. This starts by having business development and operational staff working hand-in-glove to quote for new business, so there’s confidence that teams won’t be over-stretched and that projects will be delivered on time. Project managers are best placed to be in charge here, because the environment is so dynamic (even effective teams can rarely predict what they’ll be working on more than one month ahead) that they need to be hands-on, so they can react as projects get postponed or cancelled, and re-allocate resources elsewhere. They also have an important role to play in sanity-checking projects and need that finger-on-the-pulse familiarity with each piece of work so that if a regulatory matter crops up, they can respond at speed and with the necessary level of detail. It’s said that in Amazon’s early days, founder Jeff Bezos based his management structure on small teams – no more people than could be fed on two pizzas. Takeaway preferences aside, it’s important that people are assembled into appropriately-sized teams that can re-organise themselves as necessary during the life of a project. While you don’t want people jumping on and off teams for the sake of it (and the most successful projects tend to be those that have the same team from concept to completion) you do need to be agile enough to understand that a project may need to be resourced flexibly – for example, one person at the start, 10 in the middle, but only two at the end. Similarly, if a team delivers a project early – you need to be able to identify opportunities for them to be reallocated quickly as required. You have to accept – and where possible, anticipate – that resourcing isn’t static. It’s fluid. It moves. Projects move around all the time, changing timelines or emphasis or importance relative to other projects, and your resources need to move with them. It might be important for example, to over-resource a specific project for the first milestone, or if it’s a tricky deliverable, or the client seems overly concerned about that particular stage, in order to achieve a better result further down the line. This kind of fluidity is fine, so long as there’s a structure in place for implementing it. What you want to avoid is the scenario where projects become like a kids’ game of football, where everyone’s running after the same ball in a massive huddle. That’s a recipe for getting nothing done. A final thought. 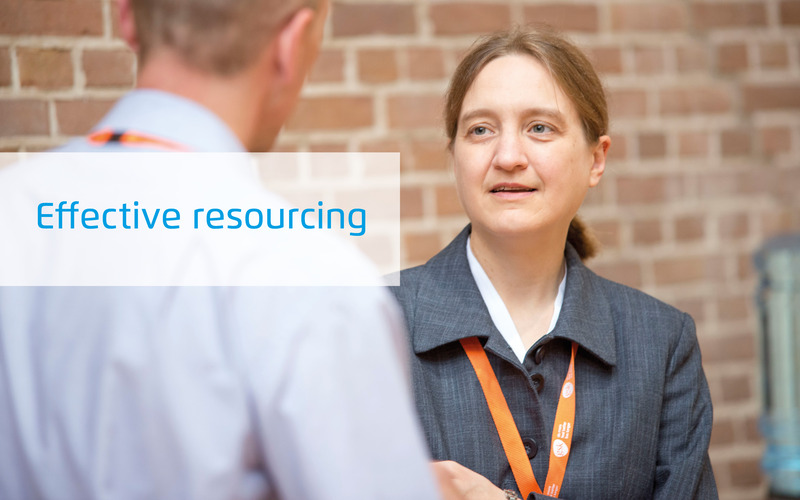 Successful resourcing is not just about future planning. You have to run the machine so it’s equipped to deliver consistent, high-quality work, to time – but not so lean that everybody is constantly over-worked, and not so over-resourced that delivering projects does not make business sense. Instead, you should try and plan for the most likely scenario and – using the principles we’ve outlined above – put a monitoring / management structure in place to be able to cope with alternative scenarios and fluctuations as they arise. It may be impossible to predict the future, but that shouldn’t stop you from planning for it.